The interior of comets and asteroids is still poorly known. A better knowledge of these small Solar bodies is particularly interesting as these bodies contain unique keys to understand the early Solar System and its posterior evolution. For the time being, our knowledge of the internal structure of comets and asteroids is, so far, indirect — relying on inferences from remote sensing observations of the surface, from Earth and from space missions, as well as theoretical modeling of formation and evolution. Comets can have a wide variety of morphologies, and several models have been proposed for their inner structure as a fractal aggregate model, rubble pile model, icy glue model, layered pile model, etc. Knowledge of the inner structure of such bodies is of great importance because it can help to deduce the scenario of their formation. Radar is a mature technique capable of probing the internal structure of such bodies. After the CONSERT experiment of the ESA’s Rosetta mission, which was the first instrument designed to probe the interior of a comet (it met comet 67P/Churyumov-Gerasimenko in Nov. 2014), the sounding of these small solar bodies with electromagnetic waves has become more and more attractive. Currently, several spacecraft are in operation, in cruise, or under development to observe asteroids, and several proposals of missions, including a radar system in the scientific instruments to get information on the internal structure, have been proposed. This recent study deals with the possibility of processing this type of radar signal to access the internal structure of such bodies. Indeed, when an electromagnetic wave interacts with an object (here a comet or asteroid), the wave after interaction contains the characteristics of this target (geometric and physical properties). It is, therefore, possible to use an algorithm, called the inverse algorithm, to reconstruct an image of this object from the measurement of this electromagnetic wave. 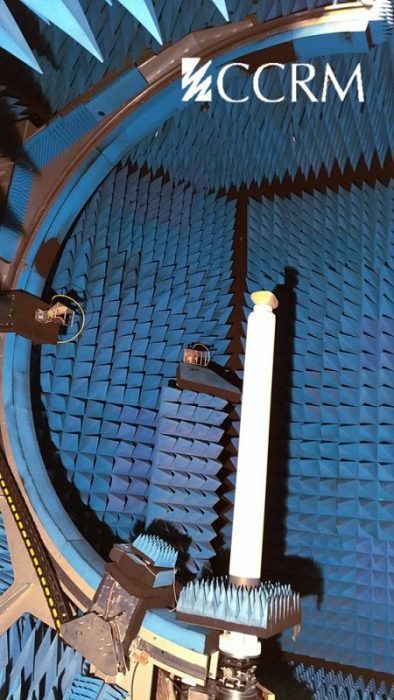 Photography of the experimental setup: anechoic chamber of the Centre Commun de Ressources en Microondes (CCRM) managed for this topic by Institut Fresnel researchers – Credit: Centre Commun de Ressources en Microondes. To solve this inverse problem, the difficulties are mainly due to the fact that a comet or asteroid is a very large structure (which means potentially a lot of unknowns) and that the number of measurements in a space radar scenario is necessarily very limited (due to time, energy, and data transfer constraints). For these measurements, a bistatic configuration is considered to obtain more information on the structure. This corresponds to the fact that the transmitting and receiving antennas are not in the same place. To this end, a scale model of a comet/asteroid was built assuming that its morphology was based on a simplified predictive model by considering only three parts: the nucleus, a layer corresponding to the crystalline crust and dirty ice, and then the dust mantle. It was used for an experimental simulation. Indeed, the interaction between this analog and the electromagnetic wave was measured in a lab environment (in an anechoic chamber) to avoid measurement disturbances. These measurements were, therefore, “inverted” with an imaging algorithm especially built to take advantage of spatial diversity (the bistatic configuration). 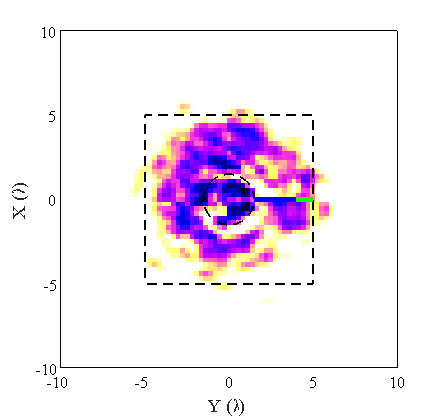 The results showed that, even with few measurements, structural information on the comet analog can be retrieved, and, in particular, the presence of the nucleus can be detected. 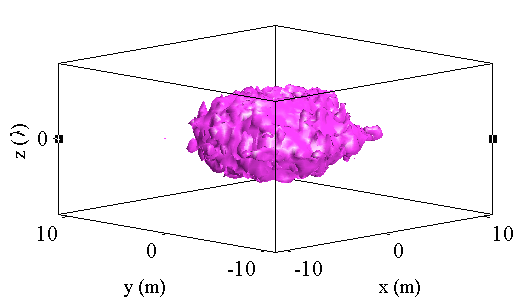 These findings are described in the article entitled Imaging the interior of a comet from bistatic microwave measurements: Case of a scale comet model, recently published in the journal Advances in Space Research. Christelle Eyraud is a astrnomy and astrophysics researcher affiliated with the Institut Fresnel. Alain Herique is a researcher at the Institut de Planétologie et d'Astrophysique de Grenoble. Geffrin Jean-Michel is Ingénieur de Recherche Institut Fresnel · HIPE : Hyperfrequency, Instrumentation, Processing, Experimentation. Wlodek Kofmais a Research Director and Professor of Physics at the French National Centre for Scientific Research and Polish Academy of Science Warsaw · Institut de Planetologie et d'Astrophysique de Greneoble and Space Reaserch Center.